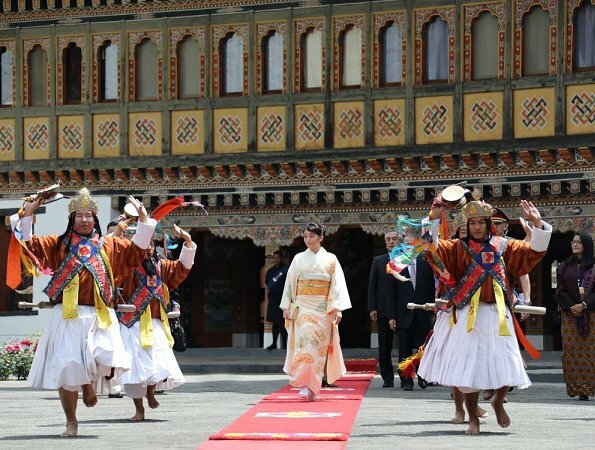 On the second day of Princess Mako 's visit to Bhutan, Japanese Princess met with King Jigme Khesar Namgyel Wangchuck and Queen Jetsun Pema at the Tashichhodzong in Thimpu. 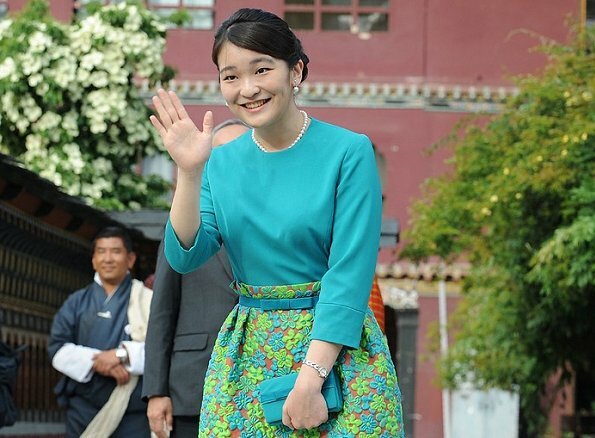 Japanese Princess Mako, the oldest of Emperor Akihito's grandchildren, is on a nine-day official visit to Bhutan. 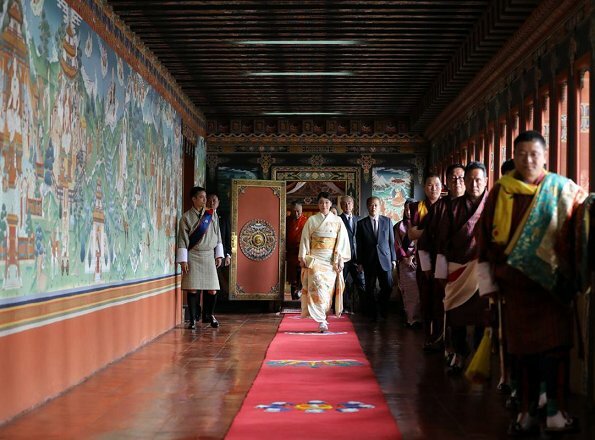 Japanese Princess Mako, Bhutanese King Jigme Khesar Namgyel Wangchuck, Queen Jetsun Pema and Crown Prince Jigme Namgyel Wangchuck pose for a photograph at the Tashichhodzong in Thimpu. 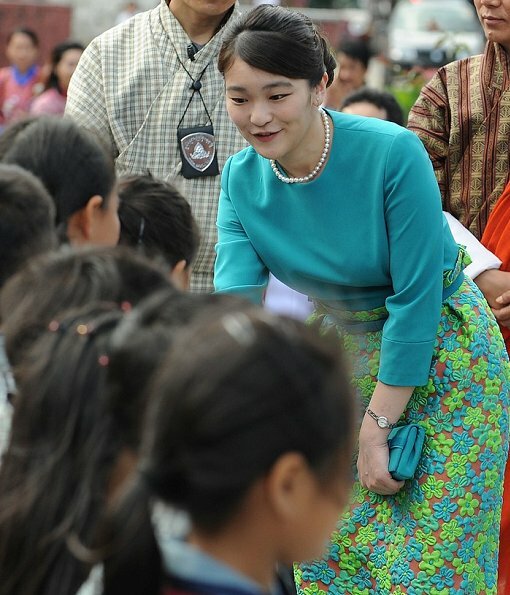 Japanese Princess Mako attends the opening ceremony for 'Japan Week' at the Clock Tower in the Bhutanese capital Thimpu. She looks so much prettier in these kind of cloth! Beautiful photos! Very lovely dress, especially the waistline detail on the skirt. I read yesterday that she will soon marry and lose her royal status. Japan is working to somehow fix the inheritance procedures because of the lack of male descendants. There is only her little brother in the line-up. La princesse Mako est La plus jolie des princesses japonaises .Ce ne doit pas être facile de sortir du carcan de la cour impériale.Son grand-père va réussir et je souhaite à la princesse Mako tous les bonheurs du monde . Mako looks outstanding in the kimono and even the other outfit is quite nice. The best thing of all is her smile, which looks so natural, at last. She is smiling! What a pretty smile she has. I love her colorful clothes on this trip. She needs to get out of Japan more often! A lesson in elegance -- she is simply stunning. Love the matching shoes. Somehow the japanese royals smiled more often in their overseas visit. Pour un pays qui prône le bonheur, je trouve qu'on ne voit pas souvent les souverains du Bhoutan rire ou même sourire. Particulièrement pour la jeune et si jolie reine, la plupart du temps, je la vois avec un air sérieux.